ZebraSci is pleased to announce the acquisition of a PTI 455 Vacuum Decay Leak Testing system. This state of the art platform is a robust and reliable solution for ensuring Container Closure Integrity (CCI) for critical parenteral applications. Vacuum decay is a proven non-destructive test method. 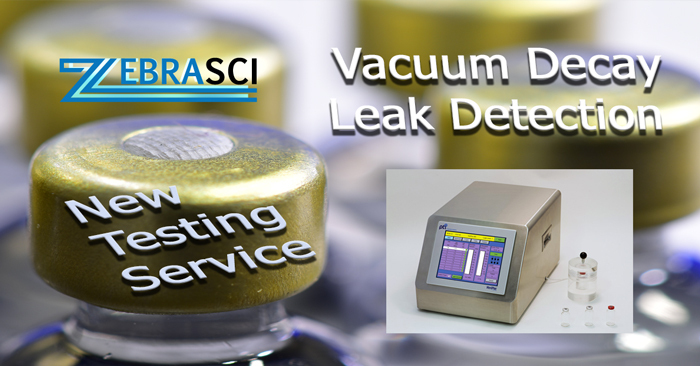 The principle behind vacuum decay leak testing make it one of the most simple and effective package integrity tests. The leak tester connects to a test chamber that is specifically designed to contain the package to be tested. The test is performed by placing a package into the test chamber, drawing vacuum on the test chamber and monitoring it for any changes in the vacuum level. If a package is defective, air or vapor will leak from the package into the test chamber causing a change in pressure. Non-leaking packages do not leak any air into the chamber, holding the chamber vacuum level constant. The test cycle takes only a few seconds, is non-invasive and non-destructive to both product and package. The standard vacuum decay leak test method (ASTM F2338) has long been recognized by the FDA as a consensus standard for package integrity testing. The test method is also listed in ISO 11607 and referenced in the United States Pharmacopeia Chapter on CCI – USP <1207>. ZebraSci’s experienced engineers are well versed in vacuum decay and other highly sensitive CCI methods. We can guide you to the best approach for your product/package combination from parental applications to sterile barrier materials. Contact us today to learn more about applications for Vacuum Decay and our other solutions for Container Closure Integrity.